Junctional tachydysrhythmias are usually due to AV nodal re-entry or to accelerated automaticity due to myocardial ischemia or stimulants such as cocaine or thyrotoxicosis. 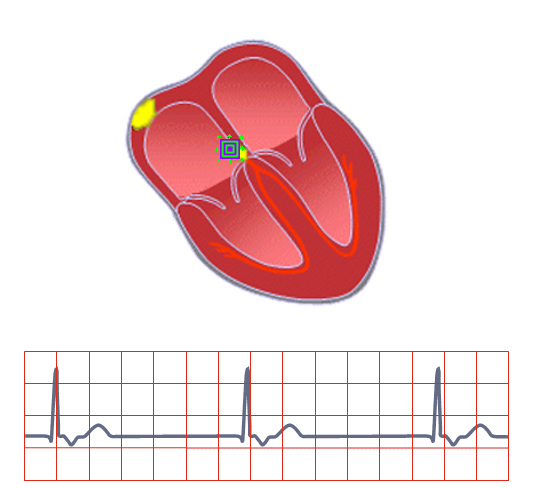 The EKGs of Junctional rhythms typically bear narrow complexes that occur regularly. P waves are usually absent because atrial depolarization occurs at the same time as ventricular depolarization and the large muscle mass of the ventricles overshadows the atrial P waves. When present, P waves (called P’ waves) are often inverted because the depolarization wave-front is going in the opposite direction than it would if it started in the SA node and went towards the AV node. P’ waves can occur either before or after the QRS complex depending on their origin. If they originate towards the bottom of the AV node or in the common bundle, it will take a while for the impulse to go backwards through the AV node and will depolarize the atria after the ventricles have already been triggered.